Social media value has become an important element in sponsorship as brands seek to connect to the loyal audiences that rights holders have built. It will only continue to grow in importance as more and more channels vie for people’s attention; particularly during live events. You know that social media is powerful tool in your list of benefits, and brands want it, but how do you value it? I’ve seen rights holders give social media away because “It doesn’t directly cost us anything to post something” and I’ve seen rights holders try and include it in all of their agreements because “Everyone is on social media these days”. Social media in sponsorship isn’t suitable for all brands; especially if they aren’t good at executing it themselves. Social media absolutely has to be aligned to the objectives and the goals of the sponsor. The fact that it doesn’t directly cost you to execute social media does not even remotely impact on the value it offers a brand. Social media still requires execution and you need to be sure that you and/or the sponsor have some creative ability to input. Otherwise, even if it is aligned to objectives and goals, it will probably fail. 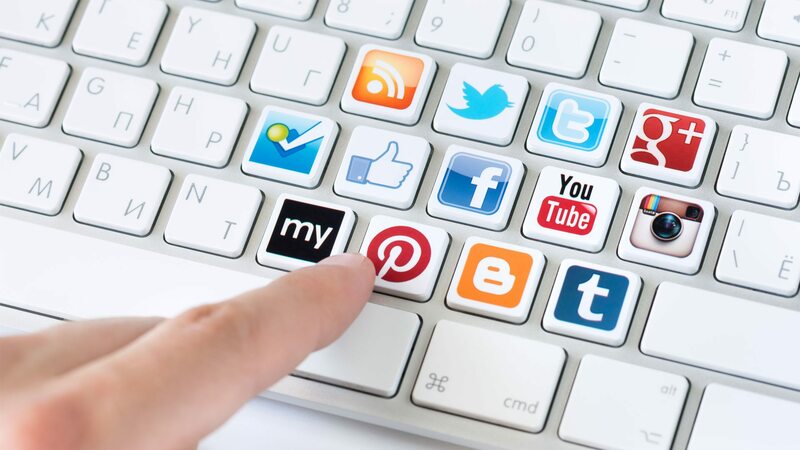 Social media is not simply another sales channel. It can be used to help sales but the execution needs to be different to other mediums i.e. it can’t simply be interruptive like radio, TV etc. Poor execution of social media can alienate your own social media audience and make your other messaging less effective. All that aside, how do you value social media posts for sponsors? 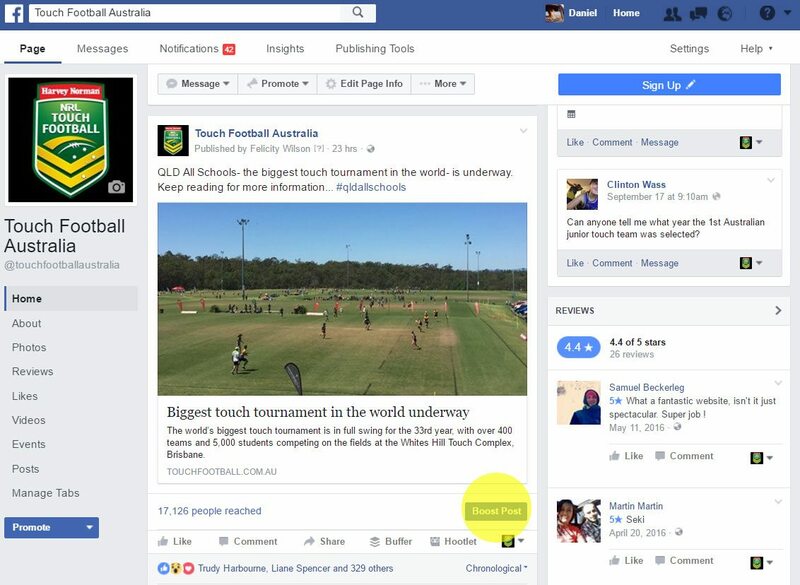 Touch Football Australia, one of our awesome clients, kindly let us under the hood of their Facebook account so we could play with some data and show you what to do. 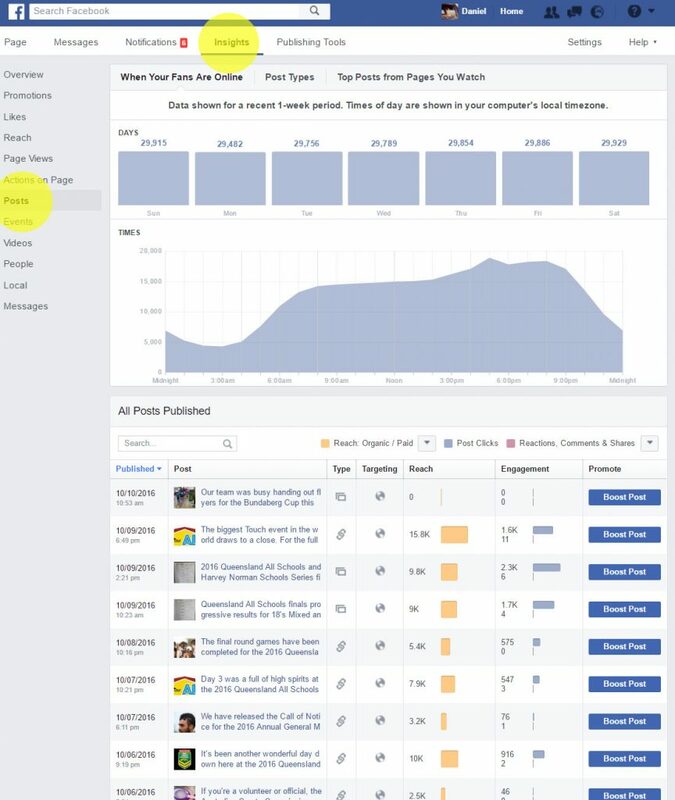 TFA have over 31,000 pages likes but the first step is to average out the reach for the different types of posts. To view the reach for each of your posts, click on ‘Insights’ in the top menu and then ‘Posts’ in the left-hand menu. Open this Social Media Valuation Template and insert the reach for the last five posts of each type (Link, Video, Image post). The last column will provide you with an average reach for that type of post. Don’t worry that the dollar value isn’t calculated (that will come soon). 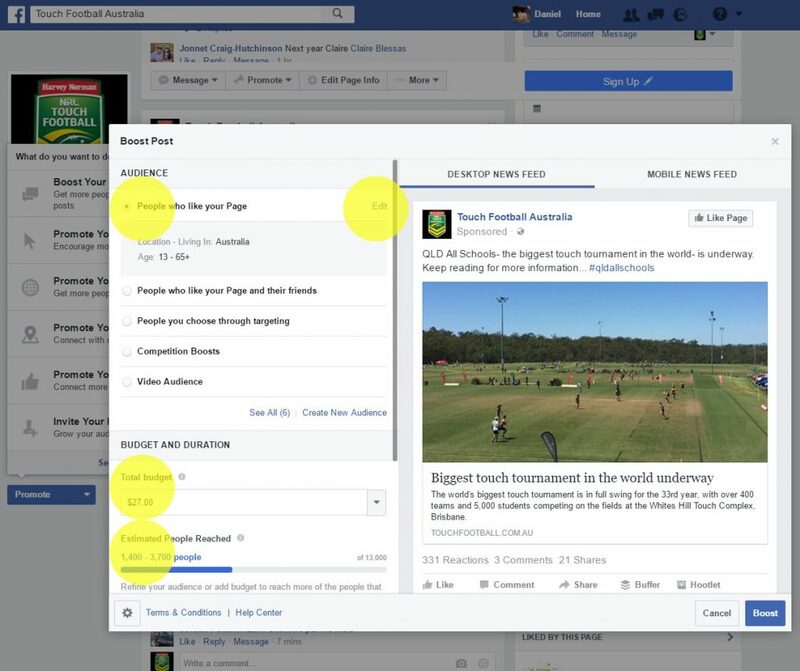 Head back to your Facebook page pick a recent post and click ‘Boost Post’. It doesn’t matter which post you choose as we won’t actually be boosting it. This will open up a pop-up window like this. Make sure that at the top the ‘People who like your page’ button is checked. To the right of that, if you click on ‘Edit’ you can create various audiences by location and age. In this example, I’ve made the audience the widest age range possible and made the location Australia. In the total budget field, enter $50 and then enter the low and high range numbers that Facebook predicts into the spreadsheet. Do the same for $100, $150 and $200. You can use whatever amounts you wish – all you are doing is finding an average cost to reach an audience. If you do choose to use different amounts then you will need to adjust the two budget columns in the spreadsheet template. At this point in time, it is important to remember two things. The first is that this is just an estimated cost per post type to reach your audience. It is not the true value that it represents to a sponsor. For example, if you value a social media post at $300 you need to remember that the sponsor can extract significantly more value from activating it. For example, they may run an engaging competition where they capture entrant details and that list may be curated into hundreds of thousands of dollars of ongoing business for them. The second is understanding, and explaining, how reach works to a sponsor because we all know people who think that just because they post something on a page that everyone who likes their page will see the post (and all their other posts!). Facebook wants to limit reach so that you pay to reach more people (Hey, they are running a business after all). That’s why value and creative is so important because the engagement (likes, shares, comments and reactions) helps give the post even more reach. It’s why TFA achieve a reach of approximately 14,000 per post. On average, 10% of people a post reaches will click on it and the average cost for a click across most paid Facebook campaigns is approximately $1. Note that 10% and $1 is based on click-throughs from a specific call-to-action and that not all of your sponsors’ posts would have this as an objective. For example, a sponsor may just want brand awareness or community engagement as opposed to clicking through to a site. Irrespective, $1 is OK to use as a value for all engagement (clicks, likes, comments, shares and reactions). Be mindful that those values don’t include any boosting that the sponsor may want to apply to their posts. Furthermore, remember that you very rarely sell individual line items to a sponsor e.g. one video post on Facebook. Instead, all of your values come together to provide a total which you then sell to the sponsor at a reduced price. As such, don’t get to caught up in worrying that a sponsor may want to question your logic about your social values (although, you will be very well placed to show them your process and how it aligns to paid Facebook campaigns). Instead, the value you assign to any benefit is always the theoretical price for a sponsor to have the opportunity to activate it. While I used Facebook in this example, with a bit of tweaking you can make this work for any social platform. The key is to simply determine what it costs to reach a certain audience and then determine how valuable it is for the sponsor to access that reach. While the step of averaging the reach for the different post types was important for the exercise, it also arms you with important information when discussing the posts you will execute with the sponsor. Taking a look at TFA’s reach averages, you’ll note that video reaches almost twice as many people as a link post and almost five times more than image posts. As such, setting expectations around the expected reach and which types of posts perform better, including the effort and skills to create them, will ensure both parties are on the same page. If you would like some more detailed instructions on how to boost Facebook posts then you can find Facebook’s official help section here. Combining sponsorship experience with a vast range of marketing, branding and stakeholder engagement roles, across many different industries, Daniel specialises in helping organisations leverage their sponsorship agreements, communication channels and content to ensure rights holders and sponsors realise return on investment.